Tron [TRX], the eleventh-largest cryptocurrency by market cap, continues to be in the limelight because of its advancements. It recently grasped the attention of the community by surpassing Monero in terms of market capitalization for the second time. Additionally, Tron recently crossed the 2 million mark in terms of daily transactions, standing right to its claim of surpassing Ethereum [ETH] the future. According to CoinMarketCap, at press time, Tron is trading at $0.0144 with a market cap of $956.03 million. The coin has a trading volume of and had witnessed a surge of 25.28% in the past seven days. In the one-hour chart, the cryptocurrency shows a downtrend from $0.0166 to $0.0156. It also pictures another fall from $0.0146 to $0.0139. The coin records an uptrend from $0.0116 to $0.0137. 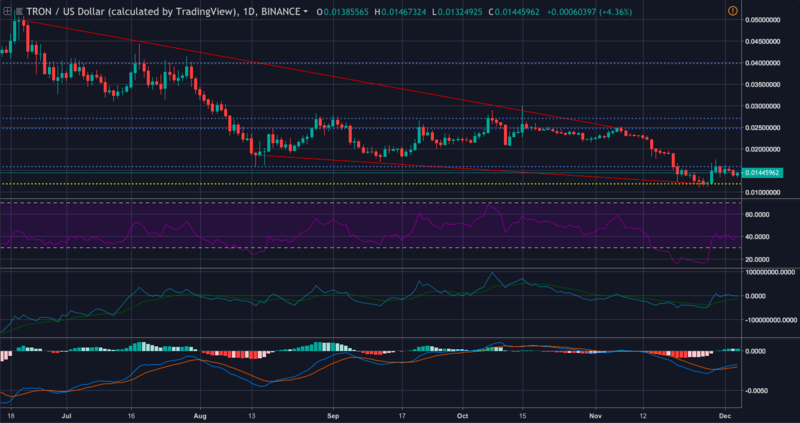 The immediate resistance for the twelfth biggest cryptocurrency is set at $0.0140 and a strong resistance has found its ground at $0.0156. The coin has found its support level at $0.0114. Parabolic SAR has started to move away from the bull’s companionship and has taken its steps to make amends with the bear, as the dots have started align above the candlesticks. Bollinger bands are forecasting a less volatile market for the cryptocurrency as the bands have started to contract. Chaikin Money Flow is demonstrating that the money has started to pour into the market for the coin, indicating a bullish trend. In the one-day chart, the coin has a downtrend from $0.0498 to $0.0247. It also pictures another steep fall from $0.0185 to $0.0119. The coin has an immediate resistance at $0.0158 and a strong resistance at $0.0247. The support for the coin is set at $0.0118. Klinger Oscillator is on the bull’s side of the market as the reading line has made a crossover only to take the direction up north. MACD has also on the same path as the moving average line has made a bullish crossover. 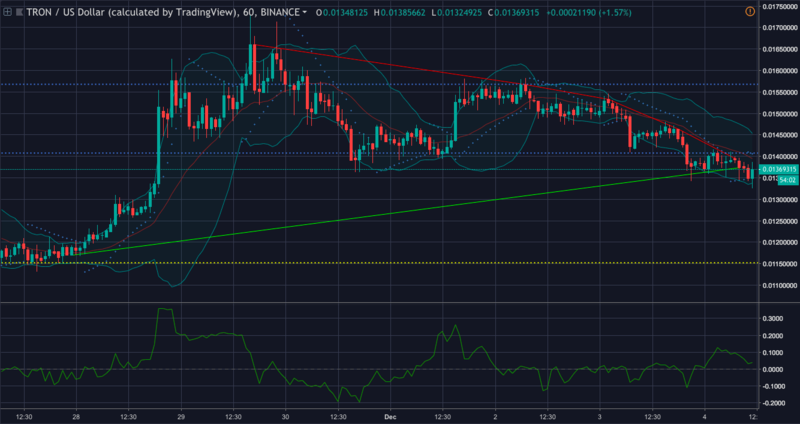 RSI is depicting that the buying pressure and the selling pressure for the coin is currently evened out in the market. The bull is ready for the run with the support of Klinger Oscillator and MACD from the one-day chart and CMF from the one-hour chart. The bear also on the field with the support of Parabolic SAR from the one-hour chart.